Although Patchen’s drawings of beasties and critters dated back to the 1950s, appearing on the handwritten pages of poetry in his silkscreen folios, it was only in the picture poems of the sixties (published by New Directions in black and white in Hallelujah Anyway, 1966, and But Even So, 1968), that the images and words achieved a truly integrated union, a symbiosis. Patchen’s picture poems are magical, or, perhaps more properly, “fantastic.” They are messages from other lands, spoken in our vernacular by vaguely familiar creatures. Figures and words share a continuum of visual presence and form a counterpoint of meaning, an interchange of energies. Words as images, images as concepts, co-existing without subservience to each other, are combined to create a richer whole. Patchen made nearly two hundred of these picture poems, all on very old off-white handmade paper, with uneven, uncut edges, all about eleven and a half by seventeen inches, which gives the impression of found, ancient manuscripts. Present in each of them is the spirit of the intensely personal and the intensely direct gift. Miriam Patchen: It’s like so many things — inventors work all their lives on trying to do something. The thing they’re doing doesn’t happen and yet accidentally something else happens, and they discover or create something they hadn’t planned on. In a way, this is almost what happened with Kenneth’s picture poems and painting poems. When he was very uncomfortable in Palo Alto [Patchen had an extremely painful, debilitating chronic spinal injury], bedfast and trying to do things, John Thomas, who is now and was then in the Department of Botany at Stanford, brought us, almost accidentally, some very strange old papers. Kenneth always loved beautiful paper, lovely types, good books. But these very strange old papers were handmade, of great, great age. They were at Stanford and were used to press, or had been holding, botanical specimens that had come from France many, many years ago. Some of the papers literally went back to the days of Napoleon’s army, and John Thomas was rather shocked when he discovered that the paper was being thrown away and burned when they were reclassifying their botanical specimens. So he, too, was interested in paper and had a little press, and he and Kenneth decided that they might do a couple of Christmas cards on the paper or something like that. But he brought the paper to Kenneth, and Kenneth was just really so fascinated by the paper he would pore over it and pet it and look at it night after night when he couldn’t do anything else. Gradually he began to think that it would be a terrible waste not to do something desirable with the paper. Fine to do the Christmas cards and some printing, yes, but this paper should exist, and continue to exist, because it could; since it was pure rag paper, it could continue to exist for some purpose other than just being around. He experimented a little with this and a little with that and gradually tested it with color, and that began to intrigue him more and more. And began to make him think of painting on the paper and doing color. Then color began to open up his mind to putting color in a sense visually into his poetry. That led to painting on the papers. He did some black drawing pages on some of the paper, but still that wasn’t satisfactory enough for the paper’s honor. So gradually the painting forms evolved because of these papers. My copy of The Argument of Innocence has a wonderful ring stain on the top right of the title page that seems to shine like a gray sun down upon on the title farther down the page. 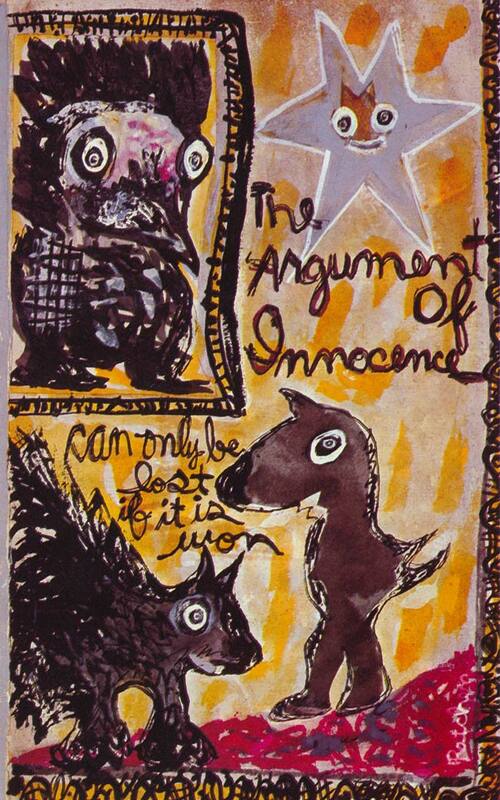 I liked this stained page so much I worked a copy of it into a painting a number of years back, also titled The Argument of Innocence. You can only lose it by winning. 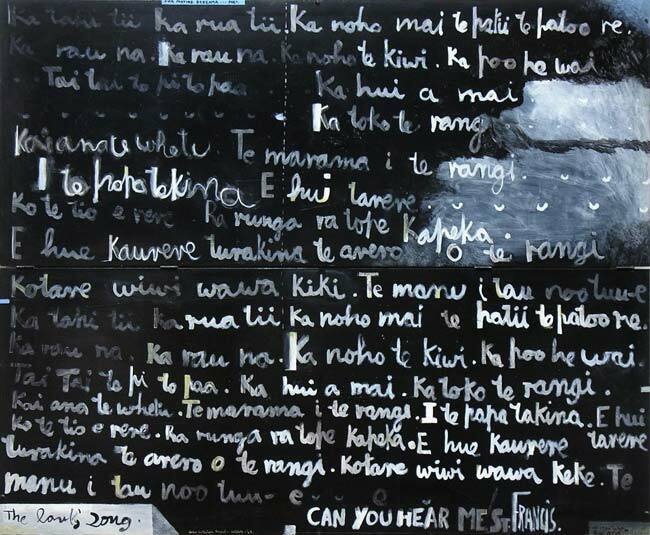 See also: Text paintings by New Zealand’s Colin McCahon.